If we've learned anything over the course of these shared Monday nights, it's that Castle isn't one of those shows that has a firm, rigid identity, like your CSIs and your Law And Orders. Those shows aim to the level of chess, a game that, in the right hands, offers the promise of drama and intellectual challenge based on how skillfully the combatants can work a few variations on an iron set of rules. 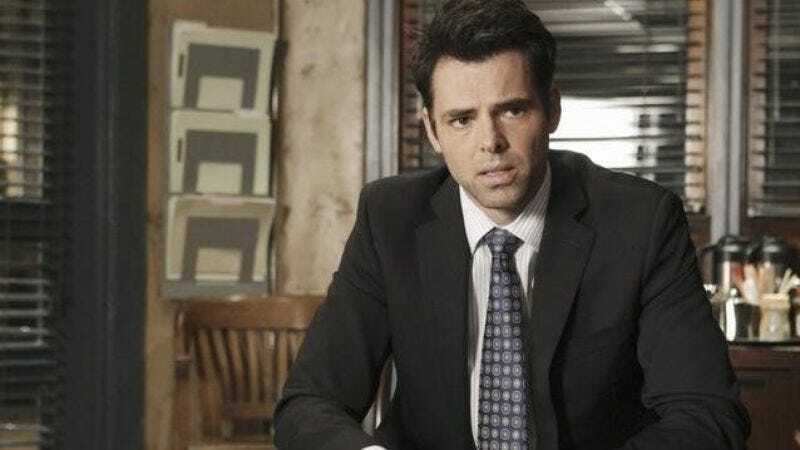 By comparison, Castle is the Plah-Doh Fun Factory of procedurals, a big goofy mold that the writers and stars can fill to the brim with whatever obsessions, passing fancies, and oddball notions happen to be on their mind that week. Sometimes, the result is a fun, spangled mess with lots of bright colors and funny shapes and yellow stars shooting over the parapets. Sometimes, either because inspiration fails or too much seriousness intrudes, it looks as if somebody just peeled the lid off the can and left the contents to dry out and harden into a brick. Tonight's episode began with the invitation to take it for a joke on the weird current trend of TV shows that take fairy tales seriously. (One of these, Once Upon A Time, is an ABC show that was bumped from its usual place on the schedule last night to make room for the Oscars telecast. Those of you who watched the Oscars telecast know that, because of this, ABC really owed us a good time tonight.) Castle is first seen hanging around his apartment, where his mother is working hard on her one-woman show, which is candidly autobiographical in the best tradition of James Frey, Papillon, and The Amityville Horror. Salvation comes in the form of a dead body found in Central Park, dressed as Red Riding Hood and shot up with a lethal overdose of drugs. (Reporting to the crime scene, Detective Ryan is moved to pay tribute to the killer's skill: “It's exactly how I pictured her. It's freaky”) Beckett is less impressed. Sure, the look is right, but the final effect makes a travesty of the Grimm Brothers' version of the classic tale, in which Red Riding Hood is alive at the end, having been rescued by a huntsman who retrieves her from the belly of the wolf who has devoured her by cleaving the wolf in two. If the murderer really cared about the source material, then maybe the dead woman should have been dressed in a wolf suit and then split down the middle. When it comes to fairy tales, Beckett, like Bruno Bettelheim, is a Brothers Grimm partisan. “They didn't sugarcoat it,” she says. Another body turns up—this time dressed as Snow White, complete with poisoned apple, though as the M.E. is quick to stress, it was another syringe full of drugs, not nature's toothbrush, that bumped her off. Castle soon begins to re-examine his first pet theory about the case, which is that the victims must have belonged to some adult fairy-tale costume role-playing subculture. It turns out that the two murdered women knew each other, suggesting some other link, a revenge motive, and a fairy tale angle that was imposed on them from within. I was very grateful for this, because I was concerned that, if Castle's initial theory held water, the whole crew would go undercover in the fairy-tale role-playing community, and I'd have to see Stana Katic dressed up as Bo Peep, possibly accompanied by Nathan Fillion wearing a sheep costume and moving on all fours, with Ryan and Espositio bringing up the rear as Hansel and Gretel. The script's failure to explore this possibility is something for which I shall always be grateful. The solution to the mystery involved a long-ago car accident, a dead man, a blackmail scheme, and a photo of costumed people crowding together and making funny faces at a party that was so convincingly stupid-looking that I had to lean close to the screen to confirm that it hadn't actually been lifted from my Facebook wall. It was, as Castle pointed out, an "I Know What You Did Last Summer" situation, which meant that the fairy-tale gimmick was mutating into an urban legends-based plot. Worlds were colliding! With all the misplaced certainty of Hugh Laurie handing down his first conclusive diagnosis of the evening, Castle and Beckett zero in on the blackmailer, who was the brother of the man who had been killed in that accident years earlier. It all seemed to make sense, except for a few things. The most obvious of these was that the show still had too much time left on the clock for the real culprit to be in custody. The real problem, though, was that there was a third supposed murder victim, who had been found drugged in her bed, dressed as Sleeping Beauty. Castle and Beckett had rescued her in the nick of time, than gone about their work trying to solve the murders, in spite of the fact that it was obvious that Sleeping Beauty was herself the murderer. The reason was simple: Whenever there's a string of murders on Castle, and then somebody who had a connection to the victims is almost murdered but is saved in the nick of time by the cops, you know it's actually the murderer staging an attempt on his or her own life to throw off suspicion. It's one rule that Castle adheres to as religiously as the rule on Top Chef about any contestant who announces that he's going to attempt a dish that he has never tried to make before in his life. In both instances, whenever that particular set of circumstances manifests itself, you know who's going home. That should have been enough for a judge, but just to be on the safe side, Castle and Beckett also throw in some stuff about how the killer had given herself half the dose of the lethal drugs that she'd given her victims and had tied the bow on her costume differently than she had on the others, because she had to tie it on herself. I wasn't sure that last bit was the clincher the cops thought it was, because there were only three bows in all, which didn't seem that many to establish a surefire pattern from which to deviate, but Castle and Beckett have to wrap things up so they can make it back to his apartment for Mother Castle's big monologue, in which she congratulates herself on having had the strength to set her career on the shelf long enough to play her greatest and most challenging role, which is, of course, Mother Castle. By this point, I was in a good enough mood that I didn't mind the close-up of Beckett folding her hand over Castle's to lend her moral support while he had to sit there listening to this stuff. Because this was an excellent example of a prime, standard-issue episode of Castle, with just enough credibility as a mystery to give the discerning Nathan Fillion fan a chance to bask in the big man's laid-back charm and appreciate the entertainment value of some banter that never lapsed into smarminess or oversold the emotions between the characters, and a supporting cast who really are pretty good when their roles stay at just the right size for them and the timing is right. "Once Upon A Crime" was directed by Jeff Bleckner, who has probably earned grander tributes in his day than hearing me say that seeing his name in the credits of another episode of Castle gives me the feeling that I'm in good hands, but he'll just have to take this one, too.